Here you will find, scalpels, suction cap, bone saws, and dental tools, such tools In the north west side of the temple there is a huge well with staircase connected with the worship of the crocodile and was used as a Nile meter. You still can see water there ! 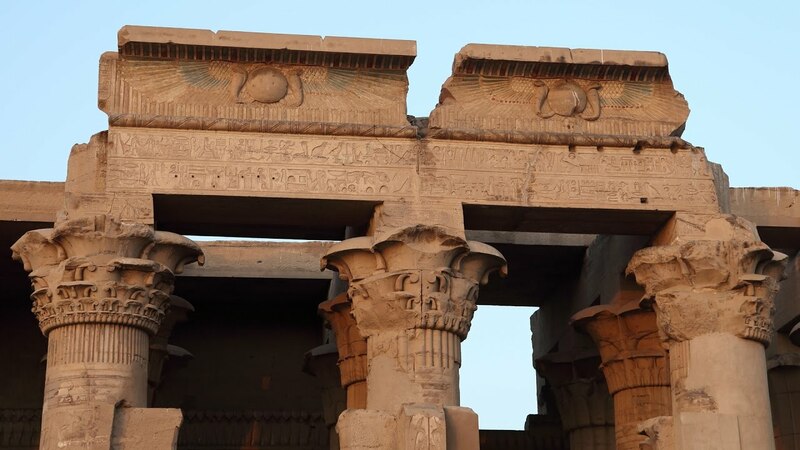 Mainly the temple was dedicated to go Sobik the crocodile god, together with his wife in another form of goddess Hathor. The temple is Greco roman structure, it dates back to the year 119 BC, and it was built out of limestone by Ptolemy VI who started the construction. The emperor Neo Dionysus finished most of the building while the emperor Augustus finished the final touches. 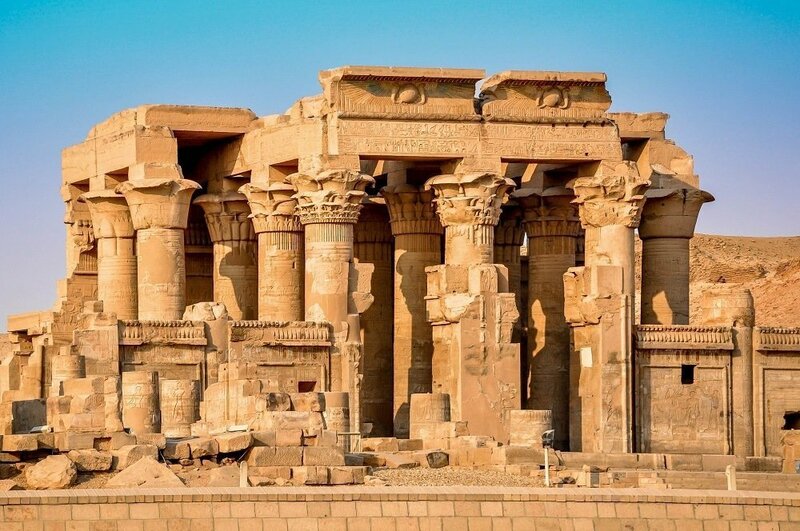 The left side of the temple is dedicated to god hours the elder, god of victory, here Horus was known as the good doctor. The temple became famous for its healing power. It was a major pilgrimage site here a healing cult was developed and the temple was a sanctuary for many patients who were seeking help and treatment by the priests. They would fast for a night in the temple precinct. You will enter the temple from the Easter side where there is an ancient gate built by Neos Dionysus (Ptolemy XIII) who was the father of Cleopatra. To your right after crossing the gate m you will find a small room that was built and dedicated to goddess Hathor. Now it is used to display mummified crocodiles that were found in the vicinity of the temple. The first pylon of the temple is now destroyed and only stones the foundation and part of the wall remained. This court was the construction of King Tiberius. When you enter from the main forecourt you will find that entrance is dived into two gateways, each leads to one half of the temple dedicated to each the twin deities. 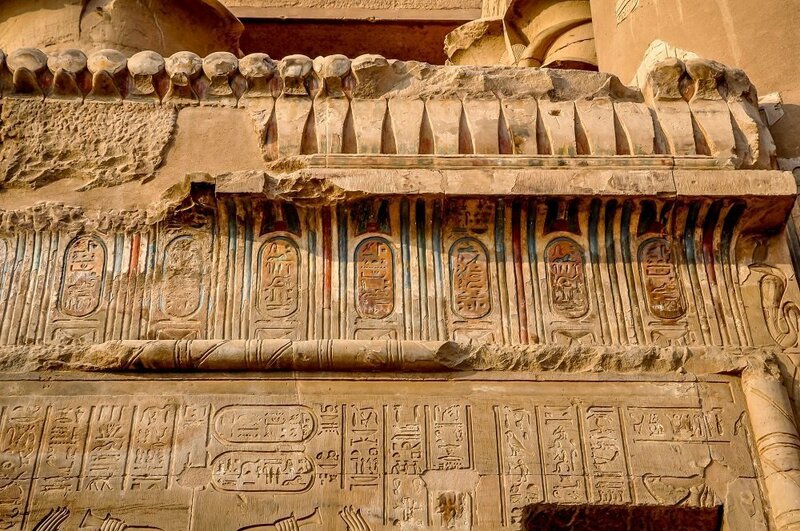 The rear wall leads to the second hypostyle that leads to twin entrances and has 15 columns five of them are incorporated in the front wall, this section shows Ptolemy VII holding hymnal texts before the Nile gods. After that you will find a three double entrance vestibule, each is smaller and higher than the last, the out vestibule shows goddess Shehsat measuring the layout of the temple and the king laying the foundation, the middle chamber were dedicated to the offering and it was only allowed to the priests. The inner vestibule has two doors leading the two separate sanctuaries of Horus and Sobik. On the inner side of the back wall of the temple is a very remarkable scene that shows the first illustration of medical and surgery tools which are presented to a seated god.